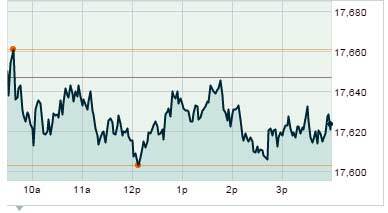 The Dow Jones Industrial Average today (Monday) dipped 25 points, while the Nasdaq was largely flat. Shares of Apple stock (Nasdaq: AAPL) dipped more than 3% after its key chip supplier offered weaker than expected quarterly earnings. Shares of Dialog Semiconductors (OTCMKTS: DLGNF) cratered more than 18% after the company offered adjusted earnings per share of $0.68, off from consensus earnings estimates of $0.70. Apple will report Q4 earnings after the bell on Tuesday afternoon. On the international front, the German IFO Business Climate Index registered a higher figure than economists anticipated. The final reading hit 108.2, beating expectations by 0.4 points. The optimism signaled its auto industry has remained largely resilient to the Volkswagen AG (OTCMKTS ADR: VLKAY) emissions scandal. Oil Prices Slip: Oil prices fell as concerns about oversupply and increasingly warm weather continue to weigh on traders. November WTI oil prices slid 1.6% to hit $43.88 per barrel, while Brent crude prices fell 1.1% to hit $47.46. Shares of Chevron Corp. (NYSE: CVX) dipped 2.7%, while shares of Exxon Mobil Corp. (NYSE: XOM) fell 2.1%. Shares of Kinder Morgan Inc. (NYSE: KMI) took the biggest blow, falling 5.7% on heavy volumes. On Tap Tomorrow: On Tuesday, the Fed Open Market Committee kicks off a two-day meeting to discuss a possible rate hike, while a busy economic calendar will keep investors on edge. The calendar includes a monthly update on durable goods, the S&P Case-Shiller Index, a report on consumer confidence, and the PMI Services Flash update. Companies reporting earnings tomorrow include Apple Inc. (Nasdaq: AAPL), Ford Motor Co. (NYSE: F), Twitter Inc. (NYSE: TWTR), Panera Bread Co. (Nasdaq: PNRA), Coach Inc. (NYSE: COH), Alibaba Group Holding Ltd. (NYSE: BABA), Pfizer Inc. (NYSE: PFE), and Merck & Co. Inc. (NYSE: MRK). Stocks to Watch No. 1, XRX: Shares of Xerox Corp. (NYSE: XRX) were off 3% after the office solutions company reported adjusted per-share earnings of $0.24, slightly beating estimates. The firm said its revenue fell short due to declining printer sales and a stronger dollar. Under pressure from investors, the firm is expected to conduct a full review of its business operations. Stocks to Watch No. 2, PBY: Shares of Pep Boys – Manny Moe and Jack (NYSE: PBY) surged more than 23% after the company announced it will be purchased by Bridgestone Corp. (OTCMKTS ADR: BRDCY) for $15 per share. The deal will allow Bridgestone's retail division to accelerate its growth strategy and increase its network of repair and service locations by 36%. Stocks to Watch No. 3, PNY: Shares of Piedmont Natural Gas Company Inc. (NYSE: PNY) were up more than 36% on news it will be acquired by Duke Energy Corp. (NYSE: DUK) in an all-cash deal worth $4.9 billion. Here's how you can profit from huge oil and gas mergers like this. Stocks to Watch No. 4, MA: Shares of Mastercard Inc. (NYSE: MA) slipped after news broke that the payment processing company has lost the business of USAA, one of the nation's largest credit and debit card issuers. USAA has decided to switch its processing to Visa Inc. (NYSE: V). Visa stock was up 1.4% on the day. Stocks to Watch No. 5, AKS: Shares of AK Steel Holding Corp. (NYSE: AKS) cratered more than 12% after the firm received a downgrade from Bank of America Corp. (NYSE: BAC). The investment firm cut its price target from $4 to $1 and said prolonged expectations for declining steel prices would weigh on stock performance. Stocks to Watch No. 6, TSLA: Shares of Tesla Motors Inc.(Nasdaq: TSLA) gained 3% after the electric auto giant announced record sales in China for the third quarter. The company announced it sold 1,345 vehicles in China this quarter. That beat Q2 China sales of 883 vehicles and Q1 sales of 797. Through the first nine months of the year, Tesla has sold a total of 3,025 Model S sedans in China.